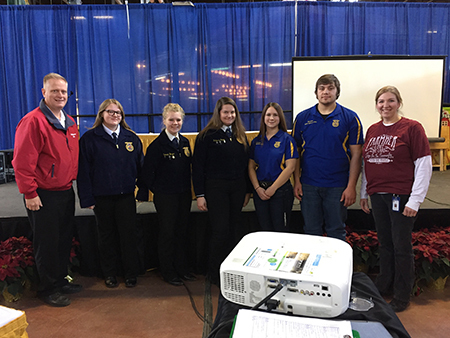 It was great to see Selinsgrove FFA students participating in this year’s Pennsylvania Farm Show! The students participated in demonstrations including building bird houses and fileting and cooking a fish. Pictured with me from left are: Danielle Stamm, Darrah Yerger and Rebecca Radel, who built bird houses; Hannah Kline and Hunter Huggins, who fileted and cooked fish; and FFA instructor Valerie Fry. January is national Radon Action Month. 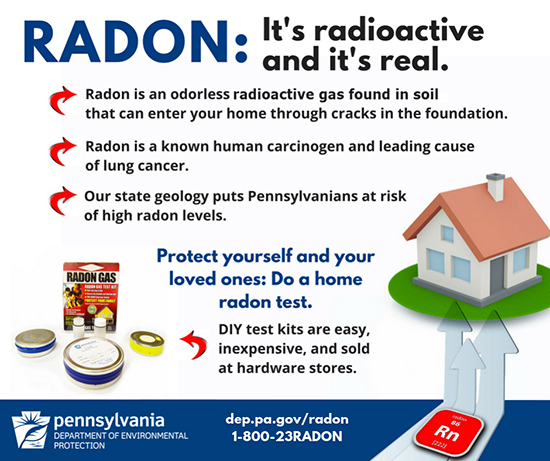 For more information on radon in the home, click here. Speaker of the House Mike Turzai has appointed me to serve on the Board of Trustees of the Public School Employees’ Retirement System (PSERS). PSERS Board of Trustees is responsible for managing the pensions of hundreds of thousands of Pennsylvanians, including public school teachers, administrators and other school employees. One of the biggest challenges facing our Commonwealth today is the huge unfunded liability of our two public pension systems. Despite policy changes, our pension debt continues to grow, driving up costs in our school budgets as well as the state budget. I look forward to working with my fellow board members to ensure PSERS’ assets are managed prudently to meet our obligations to retirees without draining our taxpayers of their hard-earned money. The current unfunded liability within PSERS is estimated at more than $44.5 billion. In addition to managing assets, the board performs required functions for the administration and execution of the PSERS Code, such as certifying contribution rates, authorizing the actuarial valuation and independent audit of the system, and publishing an annual financial statement of the condition of the retirement fund. Members review the activities performed by the system’s executive director and chief investment officer. PSERS is the 19th largest state-sponsored defined benefit public pension fund in the nation. It has a membership of more than 600,000 active members and retirees. With food allergies becoming more prevalent in our society, increasing access to life-saving medication is more important than ever. Experts estimate 1 in 13 children in the United States have food allergies and allergic reactions result in 90,000 emergency room visits and approximately 1,500 deaths annually. Check Out These Upcoming Events!! Heart of Lewisburg Ice Festival: Friday and Saturday, Feb. 1-2 in Downtown Lewisburg. Activities include a polar bear plunge, chocolate festival and tour, live ice carving, frosty 5K, children’s games, A Capella on ice, art events, and more. Click here for more information. Beat the Winter Blues Arts and Crafts Fair: Saturday, Feb. 9, from 9 a.m. to 3 p.m. at the Lewisburg Hotel, 136 Market St. Hosted by Lewisburg Sunset Rotary, the event includes hand-crafted and hand-made items from local artists and crafters! Click here for more information. R.B. Winter State Park Snowfest: Sunday, Feb. 10, from noon to 4 p.m. Activities are dependent on weather conditions and may include SNOWFEST Trail Race, snow shoe hiking, cross country skiing, ice skating, horse drawn wagon rides, ice rescue demonstration, ice fishing skills, snow mobile safety and rides for kids, a food concession, snow volleyball, broomball, an ice sculpture demonstration, winter search and rescue using dogs, and special activities for children including a winter story time, nature activities and crafts, and a silent auction to support Pennsylvania State Parks. Click here for more information. Lewisburg Children's Museum Upcoming Programs and Events: Reading of “The Mitten” and craft (Jan. 19); learning about snowflakes (Jan. 30); making Elsa’s Secret Slime (Feb. 2); reading of “Gingerbread Baby” and building a gingerbread house (Feb. 9); and STEM lessons with the Bucknell Chemistry Club (Feb. 16). Please note: fees and registration requirements apply to some of these events. Click here for additional information. All PennDOT driver license and photo centers, including the full-service center in Harrisburg, will be closed Saturday, Jan. 19, through Monday, Jan. 21, in observance of Martin Luther King Jr. Day. Customers may still obtain a variety of driver and vehicle products and services, including all forms, publications and driver training manuals, online through PennDOT’s Driver and Vehicle Services website, www.dmv.pa.gov. What’s Happening in the PA General Assembly? If you want to know more about what’s happening in your state government, look no further than the Pennsylvania General Assembly website. You will find information about upcoming committee meetings, specific bills, roll call votes, House and Senate calendars, existing state statutes and more. You can even watch session live through the site. Check it out here!